The recommendation to implement a minimum wage and establish a Wage Commission to determine a living wage standard is a significant step in the right direction. These interventions in our society will undoubtedly improve the lives of many workers in this country. The Bermuda Public Services Union [BPSU] applauds the work done thus far to get us to this point. There should be no doubt that some people in Bermuda are struggling financially. Employment statistics reveal that there are persons in Bermuda who fall in a category beneath the “Low Income Threshold”. The cost of rent, food and other basic necessities have steadily risen over the years, while wages in many sectors have not similarly increased. During the recession, in particular, there have been instances where workers have taken a decrease in pay which has diminished purchasing power for many households. 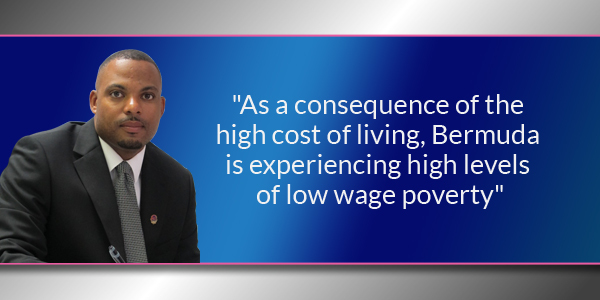 As a consequence of the high cost of living, Bermuda is experiencing high levels of low wage poverty. The 2016 Population and Housing Census Report revealed that the disparity in the median annual personal income by race has widened over the intercensal period with Blacks experiencing a 13% decline in income levels in comparison to a 1% increase for Whites. The median annual income also declined for persons who do not possess a bachelor’s degree or higher. These declines in income for Bermudians, coupled with the steady increase in the cost of living, has resulted in a marked reduction in purchasing power and, consequentially, the quality of life. Data suggest that there are over 3,557 jobs in Bermuda’s economy with annual incomes below the suggested low-income threshold hourly rate of $18.23. Approximately 1,923 employees in the hotel and restaurant sector make less than the suggested low-income threshold rate. While the impact of poverty in Bermuda may not be as easily recognisable as in other jurisdictions, over the last several years, there has been a significant increase in the number of working families seeking financial assistance and other means of social support. The demographics of persons seeking support have also changed. Historically, mainly unemployed or retired persons have sought support, but now persons who hold full-time jobs or who are underemployed also require assistance. Bermuda’s high cost of living is unbearable for many and it is becoming an increasing challenge for some. The high cost of living has persons in Bermuda struggling each month to make ends meet. Many families are living paycheck-to-paycheck and are unable to save, causing individuals to accumulate unsustainable debt levels. Emigration statistics show that, on average, 177 Bermudians leave the Island per year. Many leave because Bermuda has become unaffordable and employment opportunities are limited. I have had the opportunity to be a part of both the Labour Advisory Council Living Wage Sub-Committee and the Joint Select Committee on the Implementation of a Living Wage Regime. From my participation in these committees, I categorically conclude that many people are struggling. Improving salaries/wages, while a necessary step, is only a part of the measures needed for improving the quality of life for many Bermudians. A holistic approach is needed to adequately address the long-standing inequities that continues to perpetuate within our society. Our tax system, which currently places the highest tax burden on persons that can afford it the least, must be reformed. Additionally, we must earnestly tackle the cost of living, primarily addressing the high cost of both housing and healthcare. Why is government allowing companies to continually make staff members redundant? Before these businesses make redundancies they seek permission from government. Most of the ones being made redundant are the lower paid staff. While the managers and above keep their jobs. They use redundancy as an excuse to get rid of staff and should not be allowed without a lawful reason. Too much of this happening, then we wonde4 why Bermudians cannot make ends meet. Government must stop allowing redundancies just because the CEO or whomever wants to get rid of individuals. No businesses need permission to make redundancies. They might notify them as a courtesy. Oh Really, are you for real? You say “Most of the ones being made redundant are the lower paid staff. While the managers and above keep their jobs”. Let me explain what might not be obvious to you. Most businesses have a manager for every 5 or 10 or more regular employees! So naturally there would be 5 or 10 or more times regularly employees let go for every one manager? In additionally a manager I one that has the ability to manage things where most employees are hired to do a task or two? So if times were tough , would you get rid of the person that can manage all aspect of the business or the person that knows one part of the job? I appreciate that there are employee’s that do a better job and know more then their managers. But those are exceptions and not the rule,. And the good news is that those employees that have records of showing up to work every day, and work hard will get a job quickly and become management material themselves. This is an excellent article, a living wage is very important. Bermudians should not have to leave their home Country, due to a financial inability to survive. Housing is the biggest burden, many home owners are making it unsustainable for families to afford the high rent. We need to be our brothers and sisters keepers. The Government is assisting persons in financial difficulty to the tune of 50 million dollars. This is not sustainable, job opportunities attached to a living wage is a good starting place. I think we need to start with clarity of terminology. We need a minimum wage not living wage. Here’s why. Bermuda is so expensive that a living wage would hover around $50 per hour. A minimum wage would hover around $20 an hour. The minimum wage is a starting point with salaries increases being negotiated over time. As no one can control the price of goods in Bermuda, the living wage will keep increasing to meet the simple cost of living in Bermuda. If a living wage policy is implemented we know how it will end. Yes, and forcing employers to pay employees more will only make emigration by Bermudians worse. Employers will have to either cut staff to contain the increase in costs or raise prices to account for the increase in costs. Possibly both. Either way, jobs will become more scarce and the cost of living will increase. Why does Jason Hayward not understand that socialism does not work. I am encouraged by your powerful words of wisdom on the news this morning. Since that O.B.A. came into power, Bermudians have been put in odd positions. That is seriously WHY they lost the last election. Mr. Hayward, continue to implement, enforce, then reinforce ALL of your policies to promote better living strategies/ideas for BORN BERMUDIANS to have improved, financial lives. Nevertheless, persevere on in a powerful, positive ,disciplined light for BORN BERMUDIANS FIRST. This guy is a joker. He is the one that marched up and down Hamilton and blocked parliament over allowing more people in Bermuda to get status. People who would have provided JOBS!! We all know Bermuda’s general population is in decline and now this guy is saying less people need to pay more. The PLP promised to make Bermuda more affordable but you can’t do it by putting more of a burden on employers!! Employers are already picking up half the bill for increased health costs. The solution is to grow the population!! Actually he is the guy that helped hand the oba/UBP a kick out the back door. 24 PLP – 12 oba/UBP in 2017. To make matters even more funny it’s now 2018 and 25 PLP – 11 oba/UBP because the oba/UBP leader is sleeping. How dare you blame the voters for being deceived again. They know not what they do. I hope the plp are honest with the base soon. Jason needs to wise up like his boss and wake up to the national debt and the pension fund that is running out living wage my backside This government is a train wreck that will hit a brick wall over finances. If this happens, I will have to make 2 or 3 people redundant. Either that, or I raise the price of my goods. Period. So do I hurt 2 or 3 people or hurt all Bermudians via their wallet? And if Bermudians stop buying my products, my small business will fail. Jason , Try building an apartment house , than tell me the cost . Let’s use union labor . The majority of the people at the bottom end are FOREIGNERS .To help Bermudians it may be best to start a voucher system . Many of these foreigners get dis counted housing from their jobs , plus can eat on the job , many of their meals .You are just putting more money in their pockets .They are laughing all the way to the BANK . This is what is called , UN intended consequences .GET THE GOVERNMENT TO START A FARMER’S MARKET , i.e. bread in the U.S.A. that would cost $ 1.50 should not cost $6.85 in Bermuda .Jason , There are foreigners in Bermuda driving trucks on the job .Surely a Bermudian can do that . Where is the UNION when you need them ? You cannot legislate higher wages. It is a disaster waiting to happen. All of those increases will simply get passed down to the consumer in one form or another. SO, while people may make more money EVERYTHING will get more expensive. So, those workers who think they will earn 50k for washing dishes will also be paying $20 for a gallon of milk. (As an example). Please do some research. Have a look at Venezuela’s socialist paradise. It is now one of the most dangerous places in the world to live. People are killing each other in bread lines. “It will never happen here” is no doubt what most will say. Why not? Why are we so special that we can avoid history?